Pat Enright's unique, sweet-yet-throaty vocal tone sets him far apart from other singers. “When I first start working on a song from someone else's recording, I listen intently just long enough to learn the lyrics and melody. And then I put the thing away and never listen to it again,” he said. 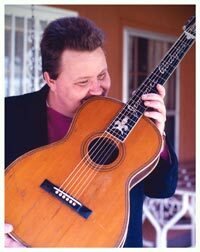 Rather than duplicating what he hears, putting distance between the original recording and his personal rendition helps Enright make the song his own. He has a clear and playful voice, something he learned from his favorite singer, Jimmie Rodgers. “The music he did really stuck with me.” Pat also paid close attention to the works of Jimmy Martin and Hank Williams. “Most of all I admired their choice of songs,” Pat said. “But that white blues delivery Hank did on so many songs, well, that blew me away." Pat Enright fell in love with music as a boy in Huntington, Indiana. The old Philco console was always on, often dialed in to WOWO which shouted out the popular country music of the day. Pat had a natural affinity for singing and was delighted when his parents gave him a quality Gibson guitar for a high school graduation present in 1963. After high school, Pat moved to Cleveland, Ohio, to attend the Architectural Engineering Institute there. He loved architecture and assumed that's what he would be doing the rest of his life. When Pat's number was about to be called for the draft in 1965, he chose to join the Navy. It was while he was in the service that he heard the sound of a banjo coming from the laundry room — and Pat was hooked. He and a sailor pal became huge bluegrass fans and went to see every show they could get to. "There was a lot of good music in DC at the time. But when we went to see the Country Gentlemen... now that made me want to become a musician." Upon leaving the Navy, Pat headed home from the Philippines deathly sick with pneumonia. Music was the farthest thing from his mind. For a short while he worked as a draftsman in Indiana. But fate would have it that he would meet a man named Paul King, a musician living in San Francisco. King told Pat he'd give him a place to stay if he wanted to try life in the Bay Area. Pat took King up on his offer and moved to California in 1969. Once there, Enright took up the guitar in earnest. Before long he was playing anywhere someone would allow him. His voice was strong and well-liked, and his guitar style tasteful. He and Paul King began to perform in San Francisco as The Tonto Basin Boys. Pat recalled, “We had an opportunity to open up at this little event for Asleep at the Wheel, who were just getting their start. I'll never forget how encouraging they all were. Chris O'Connell, gosh, she was just great. I was so impressed with her.” Support like this sustained Pat through 1973 when he joined with Gene Tortora, Robbie McDonald, Paul Shelasky and Laurie Lewis to form the The Phantoms of the Opry. The group recorded one memorable album together, then split up within the year. Pat experienced even more encouragement from Bruce Nemerov. “He encouraged me to come to Nashville. I think he was playing in High Country, the Bay Area bluegrass band, at the time. He was somehow able to convince me that I might get more out of the scene in Music City.” So in 1974, Pat Enright relocated to Nashville. Alan O'Bryant had just moved there as well and the two became friends at the newly opened Station Inn. Both were eager to play and each spent time forming and working in new groups... and occasionally together. No doubt they were unbeatable duet partners from the git-go. Then in 1975, Pat hit an unfortunate bump in the road when he lost his sight in one eye. While changing guitar strings one day, a string end popped up and put his left eye out. He went through a tough patch, living in a friend's basement with no heat, having difficulty adjusting to seeing with only one eye, and needing to wear thick, dark sunglasses for an extended time. Restless, Enright returned to San Francisco and played a few gigs there. But he missed the Nashville music scene and headed back after nine months. Enright had befriended an awesome young banjo player named Bela Fleck who invited Pat to work with him in 1978, though the job required moving away from Nashville for a spell. Pat spent the next two years in Boston, performing with the Tasty Licks (Pat, the 18-year-old Fleck, Mark Schatz and Jack Tottle). The group recorded two albums for Rounder Records, Tasty Licks and Anchored to the Shore. In 1979 Pat appeared on Bela Fleck's first solo album, Crossing The Tracks as well which also featured Schatz and Jerry Douglas, Sam Bush, Bob Applebaum and Russ Barenberg. By 1982, Pat had earned a coveted spot in a band with some of Nashville's finest bluegrass players. The Dreadful Snakes included Enright, Bela Fleck, Jerry Douglas, Blaine Sprouse, Roland White and Mark Hembree. Rounder Records released their only album in early 1983, Snakes Alive. Though Enright humbly says the band was loosely put together for a few gigs and a recording project, the Dreadful Snake's CD still gets airplay today, the album now one of bluegrass music's most respected. It wasn't long after that Pat and Alan O'Bryant formed the Nashville Bluegrass Band. All four members of NBB brought songs to the table, but the tunes that Pat liked the most were the gospel harmony numbers. “Alan and I both liked that kind of music. We had four people and we all sang — it seemed logical to give it a try.” The first tune they tackled was Sister Rosetta Tharpe's Up Above My Head. “It was orginally recorded with seven female voices, but we boiled it down to four. We worked and worked at getting every last note right,” Pat remembers. NBB would eventually record an a cappella song on each of their CDs. Though the road was hard, Pat stood up to the pressure. His stature in the acoustic world climbed as each NBB recording became more popular than the last. Throughout the 80's, the band was in hot demand, but by 2001 things began to slow up; the boys were looking forward to staying a little closer to home. However, it was a short-lived hope. In 2000, Pat had been invited to a session over at Ocean Way's studio on Music Row. The project was the soundtrack for the soon-to-be-blockbuster movie O Brother, Where Art Thou? Pat was to sing tenor harmony — and yodel— for one of the three main characters, Pete, who would be played by John Turturro. It was an inspired fit. Pat had been yodeling in the act for some time. He claims yodeling just came to him, that nobody taught him how to do it. Perhaps it was all those Jimmie Rodgers songs he swallowed whole when he was younger... no matter, it made Enright somewhat famous. Pat also made an appearance in the film itself — well, at least his voice did. In one scene where a family is sitting around an old radio, they're listening to the sound of Pat singing You Are My Sunshine. Along with the other Soggy Bottom Boys - Dan Tymninki and Harley Allen - Pat would personally receive two Grammys (Best Country Collaboration with Vocals and Album of the Year), two CMA Awards (Album of the Year and Song of the Year for Man of Constant Sorrow), two IBMA Awards (Album of the Year and Song of the Year), and the Album of the Year Award from the Academy of Country Music. No one was prepared for the impact the movie would have on NBB. Enright was glad to have his friends and bandmates at his side for the long major tours that would follow. For the next several years, they would become five of the busiest musicians in bluegrass music. Things are a lot more peaceful these days. A self-professed tune-hound, Pat's been collecting songs for a while to record a personal album. Plus he's always on the lookout for material for NBB's next offering. "You just never know when you're gonna run into a good tune," Pat says. "I was in Keith Case's office when Gillian Welch had just gotten to town. We struck up a conversation and she ended up giving me a tape. It had Tear That Stillhouse Down, which we recorded for Unleashed. What a stroke of luck." "I also stumbled on Kate Campbell's Signs Following, one of my all-time favorite tunes. My version is nothing like hers but she sent me a note that she liked my take on it," he recalls. "I have a couple of gospel tunes she wrote that I might do someday." Pat says he's glad to accept demos and that he'll listen to a verse and chorus at least. He also still loves old buildings. "I still seek out great architecture wherever I go. I especially loved what I saw in Tel Aviv and Spain." Pat has two guitars, both of them built by master luthier Marty Lanham of the Nashville Guitar Company. Pat's favorite is his OM style, the guitar he uses most often. Pat's owned four of Lanham's custom guitars and hasn't played anything else since 1991. He also shares endorsements with Shubb Capos and D'Addario Strings. Pat's been happily married for twenty years to his wife, Patty, an orthopaedic nurse at Vanderbilt. They live in Inglewood, Tennessee.